Monster Energy Supercross moved from its usual stop at Chase Field in downtown Phoenix, Arizona, to University of Arizona Stadium in Glendale. It could have moved in another direction, though, because the nearby city of Surprise, Arizona would have mate a fitting stop. 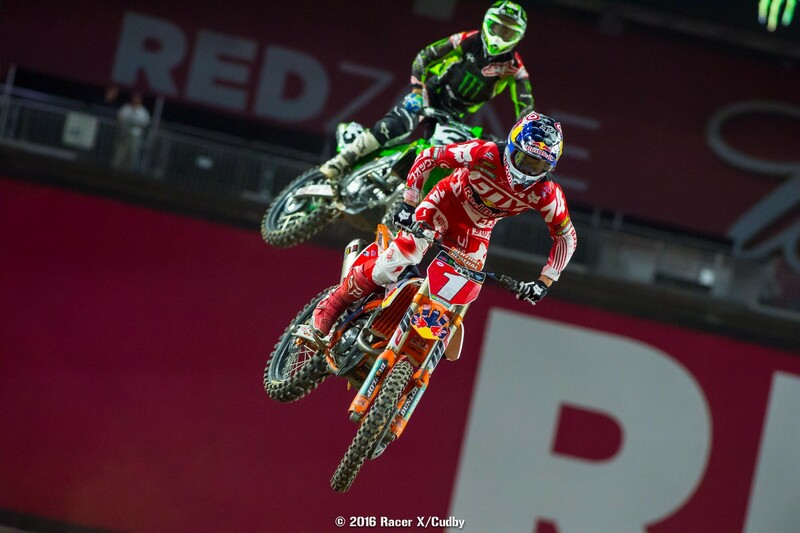 This was the first race this year where neither Ryan Dungey nor Cooper Webb won on the same night, breathing life and confidence into two riders who have been chasing them hard as of late: Ken Roczen in the 450SX class, and Christian Craig in 250SX. Not like Dungey and Webb weren’t fast, and in fact they reeled in some time on their rivals during their main events. It wasn’t enough, though. In the case of the 450s, Red Bull KTM’s Dungey got his first dud of a start this year, coming out of the first few turns in 11th. Soaring Eagle/Jimmy John RCH Suzuki’s Roczen, meanwhile, finally snapped his start slump by coming out in second, and then made short work of BTOSports.com KTMs’ Davi Millsaps to get the lead. It’s the first time Roczen has led in a main event all year, and he knew what to do with it. He might not have been the flat-out fastest the whole way, as Monster Energy Kawasaki’s Eli Tomac got to second early and put a run on him, and then Dungey later took that spot away and closed on Roczen a bit, but it didn’t matter. Roczen put together the cleanest overall race between his good start, strong early laps, and strength all the way to the end, more than enough to notch his first SX win since January of last year. Dungey eventually got to second and did close up some time, and Roczen was aware of it. After the race, Roczen said he rode most of the track well but was too conservative through the very difficult whoops. He knew Dungey made some ground on him, so he and his team will continue to put in the work to try to close that speed gap. Dungey’s three-race win streak is over, but he’s now finished no worse than second in a supercross for a full calendar year, and now has 21-straight podiums (Chad Reed holds the all-time mark with 25 straight). His ride was probably as impressive as any other this year even though he didn’t get the win. Long time coming for Tomac to get his first podium of the season, via third, but for awhile it looked like it could be more. Eli tucked into the inside in turn one nicely to scratch out a good start, got around Millsaps to get into second, and then made a brief run on Kenny. Tomac told us at one point the race reminded him of last year’s Phoenix race, where he caught and passed Kenny for the win, but in the second half of the race Eli wasn’t as strong, and that allowed Roczen to get away and Dungey to take second. After the race, Eli was happy to have finally podiumed, saying huge bike changes this week really paid off. However, he couldn’t put up much of a fight when Dungey got to him, and admitted he’s got to find eight more laps or so. Considering Tomac started the year late after recovering from double shoulder surgeries, that’s understandable. Good ride from Rockstar Energy Husqvarna’s Jason Anderson for fourth, but, again, he was done in by a poor start. Same story every week! Anderson did feel this start was at least somewhat better than his last few, but he was disappointed he couldn’t quite hang with Dungey as they came through the pack. The hardpacked, slick Phoenix track required patience, and Anderson thinks he tried a little too hard to hang with Dungey, got on the gas too early, spun too much, and lost time. 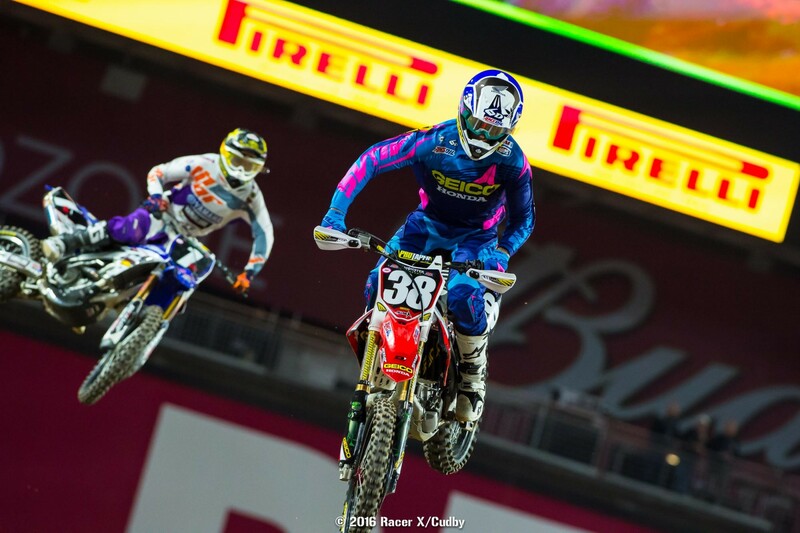 Another solid night for Millsaps, who has been good in his revival with BTOSports.com KTM. He won his heat race and led briefly in the main, then held on for a solid fifth, his season best. Ah, the 250s. 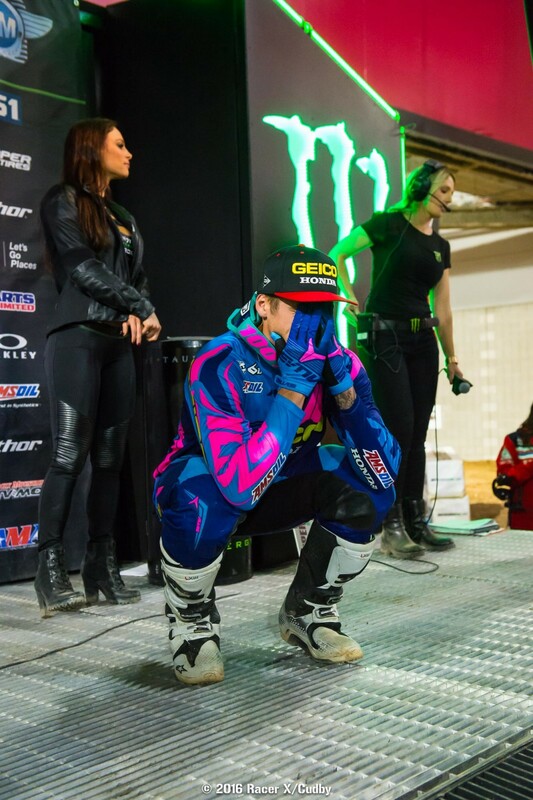 The Christian Craig versus Cooper Webb battle has been raging for three weeks now, and this time, for the first time in a main event, GEICO Honda’s Craig got the upper hand. As had been the case for several of these races, Craig got a great start, just edged out by his teammate Jimmy Decotis for the holeshot, and took the lead. Webb’s start was poor (can we say “as usual” here?) but he made amazing moves on the first lap to get to fourth, then third, and then second. Webb ate into Craig’s gap, he was quicker in most places, but Craig did have him covered in the whoops. Webb kept closing and tried making a move, and they came together over a jump. Craig wanted it to be known that he only tagged Webb because he was trying to get to his preferred whoop line on the right side, and that’s the line Webb was aiming for as well. The next lap, Webb tried to dive even deeper inside and lost his front end. That was it—Webb was out of time to make one more charge. Craig’s win was an emotional one. The man retired from racing at the end of 2013 before mounting a full-scale comeback last summer. “Preperation,” said Craig when we asked what the difference is between him now and his previous incarnation. Make no mistake, Webb is still the fastest man in the class, but now, due to a mechanical failure last week and a washout this week, has lost two in a row. The good news is he finished in front of title rival Joey Savatgy. The Monster Energy/Pro Circuit Kawasaki rider struggled at times during the day and night, and when Webb fell trying to get Craig, Savatgy was unable to take advantage. He explained on the podium after the race that he was struggling with an illness. He and Webb are now tied for the points lead. In the 450s, oh wow did a battle rage behind the Roczen/Dungey/Tomac trio. Anderson, Millsaps, Chad Reed, Marvin Musquin, Justin Brayton and Cole Seely all went at it. Seely was there at one point, actually in fourth, before he stalled his Honda and went to the back of the train. Reed was there but didn’t seem to have the same magic on this night as he’s had in others, and was passed by Musquin and nearly by Brayton. Then Chad kicked his veteran experience into action, cleaning everything up in the second half of the race, repassing Musquin and pulling away from Brayton. That left Millsaps fifth, Reed sixth and Brayton seventh. Musquin, who podiumed last week, told us the whoops got the better of him this time, and he started making mistakes in them and going backwards. Brayton was happy with his ride and felt it was his best of the year, but was amazed that Reed, who he seemed so capable of passing, kicked it into another gear late and got away. Seely was eighth after stalling, but he did catch Musquin, and when he passed him his front wheel tagged Musquin’s rear and put him down. Musquin recovered for ninth and Wil Hahn took his season’s best with tenth. This stadium was a nice upgrade over Chase Field, which is saying a lot because that stadium is cool, too. The most unique part was a track that actually went outside the stadium, adding a lot to the lap times—no one ran one under a minute. It also opened up a jumbo-length start, which took riders into fourth gear. Tomac told us he thinks he went faster down the start straight than he even does in any section of Lucas Oil Pro Motocross. The field finally got what they wanted, and needed: a bad start for Ryan Dungey. The champion started about 11th, while Davi Millsaps, Ken Roczen and Eli Tomac were up front early. Roczen wasted no time getting into the lead. Then on lap three Tomac took second from Millsaps. Dungey had work to do and the fastest riders in the series were around him—Jason Anderson just behind, Chad Reed and Cole Seely just ahead. Dungey took the measure of Reed in the corner outside the stadium, then he was on both Millsaps and Seely on lap five in a three-way fight for third fourth and fifth. Ahead Roczen began to distance from Tomac. Seely stalled in the 180 before the left exiting the stadium and that allowed Dungey to make an easy pass to third. By lap seven Tomac had found his groove and went three tenths of a second quicker than Roczen. The gap was about 2.4 seconds, but the Kawasaki rider was starting to make tracks on Roczen’s Suzuki. By halfway, Tomac had Roczen within two seconds, but Roczen responded, logging two fast laps and stabilizing the gap. Meanwhile Dungey started to find his own groove around lap 12, and began to close on Tomac. Roczen appeared to have it, except for a few rough runs through the whoops. Behind them, Anderson pushed his way into fourth, ahead of Millsaps, while Reed, not having a good night, succumbed to Musquin and took heat from Brayton. Then Reed caught fire, repassing Musquin in the same turn Musquin had passed him! Musquin started to fade, then getting passed by Brayton and then Seely, who clipped his front wheel and knocked Marvin down. Tomac looked to tire late in the race, and Dungey reeled him in and passed him in the whoops, Tomac not putting up a fight. By then it was far to late for Dungey to do anything with Roczen though, who sailed on to his first win of the 2016 season. Jimmy Decotis led the field down the mega-long start straight but his teammate Christian Craig was quickly around him. Meanwhile, series' leaders Cooper Webb and Joey Savatgy had bad starts, probably just inside the top ten early, but Webb sliced into fifth almost immediately. But he found it tough to make passes, because Chris Alldredge and Mitch Oldenburg were battling right in front of him and taking up two lines on the track. While Webb worked them, Craig and Decotis started to get away. A few laps later Webb caught and then jumped past Decotis. By halfway, Webb caught Craig and was looking to make a move, but he nearly threw it all way in the whoops. He immediately caught back up, and Webb tried a move on the inside of turn three. They exited the corner with Craig just half bike length ahead, and he literally bumped into Webb by cutting across to take his line away on the landing of a jump before the whoops. On the next lap, Webb wanted to make sure he had the pass made before that jump, so he tried to get further underneath in turn three and went down, washing the front. That was lap nine, and by the time Webb got back going, he was down about five seconds. He simply didn't have time to make up that kind of ground on Craig with five to go, leaving the path open for Craig's first-ever supercross win. "Thanks to the fans, I heard you guys on that last lap, thanks to all of you guys," said Craig. "It took me five years to get to this point. I came back to racing and I've been working so hard, also my trainer and mechanic. Hats off to Cooper, he was on me, but he went down." Webb ended up second, and Savatgy rolled through for third. "I'm feeling a little under the weather right now, but no excuses, I don't want to take anything away from Christian," said Savatgy. Webb and Savatgy will now be tied in the championship standings heading into Dallas next weekend. 450 Semi two, Jake Weimer and Wil Hahn went battling for the lead in turn one, and that slowed them enough to allow Justin Brayton to get by. Once he had the lead, Brayton was gone. Hahn held off Weimer for second. Tommy Hahn worked his way past Phil Nicoletti in a big battle, while left Filthy Phil hanging onto the final transfer spot. And here came Lawson Bopping looking to take the last spot. He tried to make the pass, and Nicoletti put him down to hold on--classic racing for the final transfer there. In 450 Semi one, it was all about the teammate on teammate action. First Mike Alessi and Vince Friese battled for the holeshot, and then Christophe Pourcel sliced past them both to get the lead. Then came Pourcel's teammate, Jason Anderson, who crashed in his heat. Anderson caught and passed Pourcel to take the win. Alessi and Friese took third and fourth, while Nick Schmidt outdueled Cade Clason for the final spot. Heat 2: Ryan Dungey. Just....Ryan Dungey. He kept doing what he's been doing. Behind him came his teammate Marvin Musquin, under fire from Eli Tomac. Tomac eventually got him for second, but Musquin gave it a good run and stayed close. The final transfer spot went to Weston Peick, but really the question that's beginning to circulate these days is: can anyone stop this Dunge train? Heat 1: On the long, long, loooong start straight, it’s no surprise that Mike Alessi nailed the launch and led everyone into turn one. However, he forgot to stop and went wide in that turn, letting Davi Millsaps underneath and into the lead. Chad Reed got a good start and was second with Ken Roczen behind him, and you’d think that would lead to a good duel. Instead, Roczen made fairly short work of Chad and then took off. Reed ended up losing a lot of time, and then late in the race Cole Seely caught him from way back. Expect Reed to go back to the drawing board before the main. Up front, Roczen closed the gap on Millsaps, but never quite got close enough to challenge him for the lead. That’s two heat wins this year for Millsaps. Yet another in what has become a classic battle in 250SX—Webb v. Craig. Craig got the holeshot and Webb tried a zillion different lines to get him, he was generally faster than Craig everywhere but in the whoops, as Craig would fend off the pressure and get away in the second part of the section. Finally on lap four, Webb crossed him up enough to get inside and get the lead, but through all that battling, Colt Nichols began reeling them both in. Nichols! The surprise of the 250SX West season took another big step by catching up to Craig and passing him for second, and at that point Webb wasn’t even that far ahead. But then Craig dialed in the whoops one more time to get next to Nichols and shut him down in a bowl turn, taking second back away. Webb went on to take the win with Craig and Nichols right behind. Wild way to start the night! In heat one, Joey Savatgy grabbed the holeshot and was dealing with huge pressure from Zach Osborne, who tried to make the move on him in a 180 left hander. Moments later Savatgy bobbled and went off the track, giving Osborne the lead. One turn later, Osborne’s bike cut out and he couldn’t jump the triple, handing the lead to Jordon Smith. Smith looked ready to win the heat, until he dropped the front end in a very gnarly whoop section and went down hard. After that, Savatgy inherited the lead and the win. At this point, it looks like you could put some good money on Ryan Dungey extending his win streak. He was fastest in the first qualifying session, and then even overcome some adversity in this final session, as his bike didn't show up when the session began. The rest of the riders were out logging fast times while Dungey just stood there on the starting line waiting for his machine. "We were just making sure everything was fine and everything was working right, no problems, just lost a few laps but it's fine, it is what it is," said Dungey. When Dungey finally got on board, Jason Anderson and Ken Roczen had already thrown down quick times, and then Christophe Pourcel did his usual one blistering lap to go to the top spot. Dungey checked things out for a lap or two and then basically had time for just one fast lap. He made it count, going right to the top of the board again. "The whoops are where the track is kind of falling apart, lot of edges you can catch," he explained. "Some areas of the track have good traction, some are a little more slippery. Long start tonight but just going to line up toward the inside and see what we can do." 250s: Don't make Cooper Webb angry. Throughout the final practice session a bunch of riders were throwing down fast times, like Joey Savatgy, Colt Nichols and Christian Craig. Late in the session though, Webb jumped to the top with a real heater. Savatgy didn't look so hot in the first session, really struggling in the whoops, but looked seemed much improved this time around. 450s: It was practically a race out there in this one, as Ryan Dungey, Eli Tomac and Ken Roczen exchanged fast laps throughout the session. As they pushed, the laps started dropping fast--and in the end Dungey's late fast lap dipped into the 1:01s. The lap times stay over a minute because the track is extra long via the outside-the-stadium section. But this course is fast. When they come back into the stadium, they're flying with a 3-2 section heading to the standard supercross triple. It's probably the fastest we've ever seen riders hit a triple. 250s: Cooper Webb is angry! He's riding without the red plate for the first time this year and out for revenge, crushing everyone with a 1:03.4 lap, second best was the very impressive Colt Nichols at 1:04. Great lap for Nichols, but that's also a heck of a gap between Webb and the field. In more anger news, we saw Webb and Chris Alldredge crash into each other in a bowl corner. We only caught the tail end of the situation and can't tell if it was a straight take-out from Webb, or just an accident. We'll find out. Webb was one of the few tripling a turn out of the whoop section, most riders are going single-wheel-tap-single into the corner. 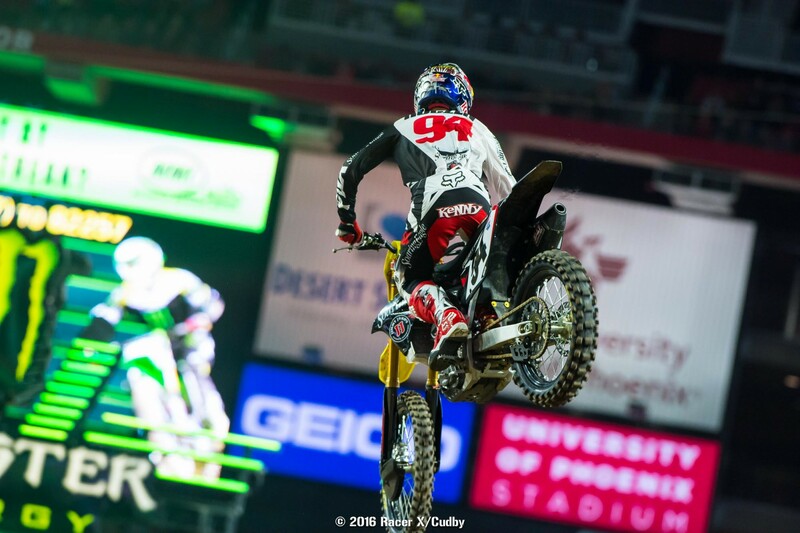 Monster Energy Supercross has moved about 25 minutes west of downtown Phoenix, with Chase Field being replaced by University of Phoenix Stadium. As Jason Thomas previewed in his Staging Area column this week, changing from a baseball stadium to a football stadium completely changes the angles of the track, as today's course features a more standard rectangular layout, complete with six 180-degree corners. That's good for passing. The most unique part of this track is the section that actually runs out of the stadium and outside the building. It's a simple section with two right handers and a table top. It adds a lot to the lap time, though, with early laps here well over the one-minute mark. The table top is actually the over of the usual over/under bridge, the under section is used as a tunnel to get bikes onto the track and loaded into the starting gates. One issue to deal with is the dirt outside will probably get very dry, as (shockingly) it's very sunny here in the desert. The stadium itself features a retractable roof, but the sun only shines in one small rectangular spot. The dirt inside will end up much more like a typical domed stadium. In rider news, you've probably already heard: The Yoshimura Suzuki rig isn't here since both James Stewart and Blake Baggett are out. Ryan Dungey is ruling the 450SX class right now with three-straight wins and will go for his first-ever four-race streak. Joey Savatgy is now sporting the red plate on his Monster Energy/Pro Circuit Kawasaki in 250SX, while Cooper Webb will have to fight back after last week's mechanic failure. Cooper has the black backgrounds behind his number one for the first time this year. Practice has just begun. Stay right here for more.